Rehabilitation Robotics gives an introduction and overview of all areas of rehabilitation robotics, perfect for anyone new to the field. It also summarizes available robot technologies and their application to different pathologies for skilled researchers and clinicians. 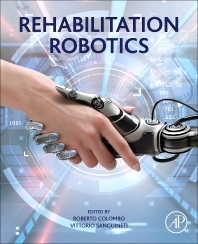 The editors have been involved in the development and application of robotic devices for neurorehabilitation for more than 15 years. This experience using several commercial devices for robotic rehabilitation has enabled them to develop the know-how and expertise necessary to guide those seeking comprehensive understanding of this topic. Each chapter is written by an expert in the respective field, pulling in perspectives from both engineers and clinicians to present a multi-disciplinary view. The book targets the implementation of efficient robot strategies to facilitate the re-acquisition of motor skills. This technology incorporates the outcomes of behavioral studies on motor learning and its neural correlates into the design, implementation and validation of robot agents that behave as ‘optimal’ trainers, efficiently exploiting the structure and plasticity of the human sensorimotor systems. In this context, human-robot interaction plays a paramount role, at both the physical and cognitive level, toward achieving a symbiotic interaction where the human body and the robot can benefit from each other’s dynamics. His research interests include: robot-aided neuro-rehabilitation, muscle tone and spasticity evaluation, muscle force and fatigue assessment, speech production mechanisms study, respiratory mechanics assessment, assessment of autonomic function through heart rate variability analysis., He has authored over 100 papers and is co-editor of a book on the subject of speech production mechanisms. Vittorio Sanguineti, PhD, is an Associate Professor of Biomedical Engineering at the University of Genoa. He received a Master's degree in Electronic Engineering (1989) and a PhD in Robotics (1994), both at the University of Genoa. He Has Been working as a post-doctoral fellow at Institut National Polytechnique de Grenoble, France (1995-1996), at McGill University, Montreal, Canada (1996), and at Northwestern University Medical School, Chicago, USA (1997-1998 and 2000 ). His main areas of interest are the neural control of movement (upper limb, orofacial and postural control), motor learning and the applications of robotics to neuromotor rehabilitation.